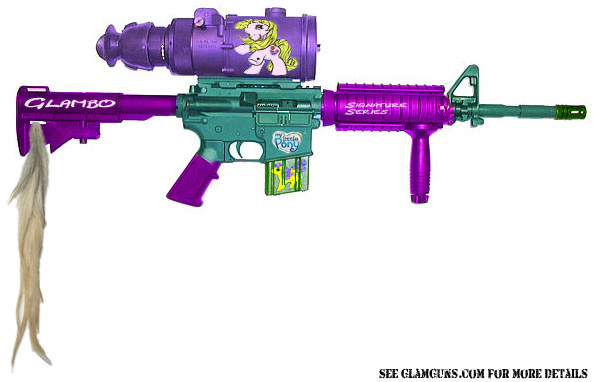 The Glambo Signature Series "My Little Pony" M4A1 carbine with forward handgrip and AN-PVS4 night vision sight. This fully functional weapon fires standard 5.56mm ammunition -- great for those AR-15 fans with extra ammo lying around the house or even extra parts! (Note: the full-auto selection has been disabled in this model in favor of three-round-burst. This product cannot be shipped to California.) The perfect way to introduce your little princess to the wonders of nocturnal wet-work!